We are specialists at repairing your Canon XA15 camcorder and we’ve seen all of the problems associated with it. Sometimes when you are filming with your camcorder you will notice it zooming in or out, or will drift without even touching the zoom switch. You may also notice that the zoom rocker is not responding when you try to zoom in telephoto or out wide angle. Zoom will not hold settings. This problem is caused by a bad zoom rocker switch. It is necessary to replace the zoom switch block assembly. The camcorder will need to be shipped in for repair. Fill out the our Repair Order Form, and ship the camcorder into us for a free estimate. The flip out LCD Monitor touch screen is dead, not powering up, black, does not light up, or is not displaying the picture properly. The LCD Screen may be cracked or shattered. There may be issues with the “touch” function of the monitor. The LCD can become damaged if the camcorder is dropped or suffers impact but this is not always the case. Sometimes the LCD screen can malfunction for no apparent reason. Your LCD screen will need to be replaced. We use original Canon parts, and will only use an original Canon replacement screen. We never use substandard generic replacement LCD screens. The reason that we don’t use generic LCD screens are that the picture quality and performance is nowhere near that of the original Canon LCD screen. Camcorder does not record to SD memory cards or does not even recognize the card. When you put an SD card inside the video camera it may be showing a red A or B SD card symbol with a circle and a line through it. Camcorder indicating there is no card when there is a card. Will not read or write to the SD memory cards. Make sure that the SD card cover is closed all of the way. Try opening the SD card cover door that covers the A and B slots and then closing it again. You can also try reinserting the memory card. Make sure to try more than one SD card. If none of these solutions work, your Canon XA15 will need to be sent in for repair. Fill out the our Repair Order Form, and ship the camcorder into us for a free estimate. If you would like to speak with a technician before sending in the camcorder, please feel free to call us at 888-283-2228. May turn on for a second and then turn right back off. Camera won’t power on fully, only some functions work. May have problems powering off. The camcorder may be powering up but wouldn’t charge batteries.These issues may be intermittent. If you are having powering problems with your Canon XA15 camera and you have tried both the batteries as well as the AC power adapter and you are still having problems then the camcorder will need to come in for repair. If you are only having battery problems, make sure that the problem is not that you are using non Canon or generic batteries. 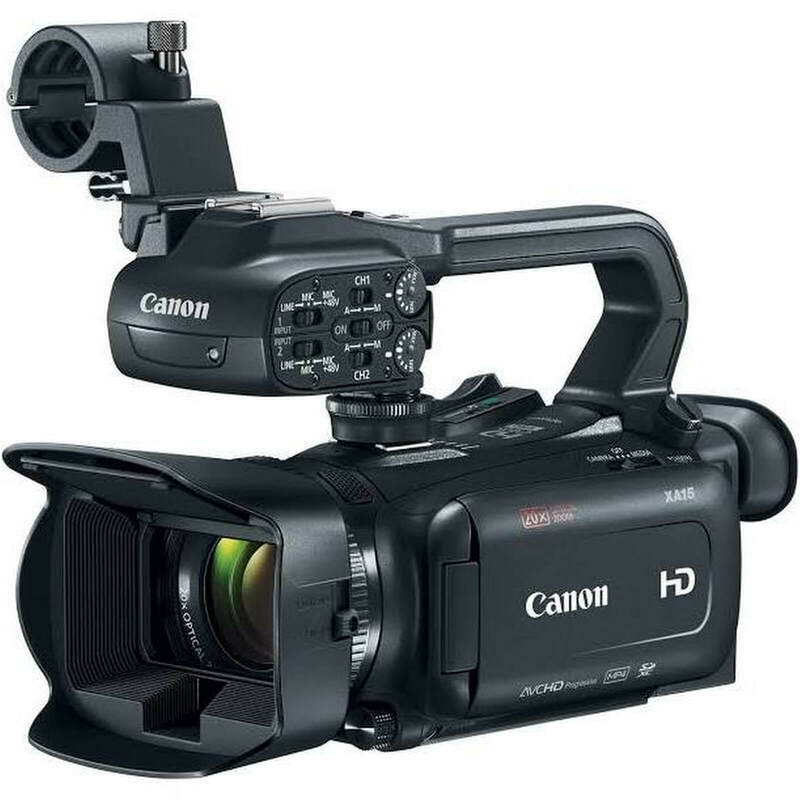 These camcorders are very sensitive to non Canon batteries and they can cause the camcorder to not work properly. If you are sure that the problem is not with your batteries, then the camcorder will need to be shipped in for repair. Fill out the our Repair Order Form, and ship the camcorder into us for a free estimate. No HDMI output or signal. HDMI terminal is loose, no longer works or has intermittent connection. HDMI connector may look broken or may look fine. If your HDMI is not working correctly we recommend trying to do a factory reset to the camcorder. Resetting the Canon XA15, is done by the following steps. After resetting the camcorder, power the camera down, remove the power source such as the AC adapter or battery and then try the camcorder again. Select the [System Setup] menu. If the camcorder continues to have problems, the camcorder will need to be shipped in for repair. Fill out the our Repair Order Form, and ship the camcorder into us for a free estimate. If you would like to speak with a technician before sending in the camcorder, please feel free to call us at 888-283-2228. Can see dirt or spots behind glass of lens. There is spotting in recorded footage. Dirt underneath the camera lens or sensor that needs to be cleaned. There is no way for you to access the internal lens or sensor without dissembling the camcorder and the lens block. Headphone jack is loose or has a flaky intermittent connection. Buzzing sound or static when using headphones. If your headphone is not working correctly we recommend trying to do a factory reset to the camcorder. Resetting the Canon XA15, is done by the following steps. After resetting the camcorder, power the camera down, remove the power source such as the AC adapter or battery and then try the camcorder again.